ENDERES TOOL COMPANY was founded in Albert Lea, Minnesota in 1910, the result of a merger between Albert Lea Machinery Company, which was founded in 1908 in Albert Lea, Minnesota, by Joe Pihl; and Enderes Manufacturing Company, which was founded in 1896 in Littleport, Iowa and was owned by Ernst Enderes. Enderes Manufacturing Company produced three tools – a 14" cutting nipper, a staple puller, and a drop forged cold chisel. The Albert Lea Machinery Company sold those three tools for Enderes Manufacturing Company. Sales soon outstripped production capabilities, and an expansion was required. The entire operation was relocated to a new plant in Albert Lea, Minnesota. The old octagon tool plant burned to the ground in 1966, and we built our present plant. Enderes has always been a family-held corporation. You can count on one hand, the tool companies in America that have had that long a life span that are still owned and operated by the same family. We take pride in that! SINCE 1896, the primary thrust of Enderes Tool Company has been to produce only the highest quality Struck Hand Tools. We can document and illustrate that all of our tools exceed any written specifications that have ever been generated on struck tools. One of the keys to quality is the utilization of time-honored manufacturing techniques. 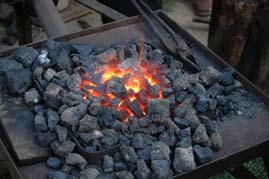 These “Blacksmith” techniques impart a quality to struck tools, which cannot be obtained with some of the modern mass production techniques utilized by our competitors. We have committed ourselves to produce only the finest quality struck hand tools. This commitment and dedication to quality craftsmanship and manufacturing techniques should make you feel very confident when you stock or buy Enderes Tools.